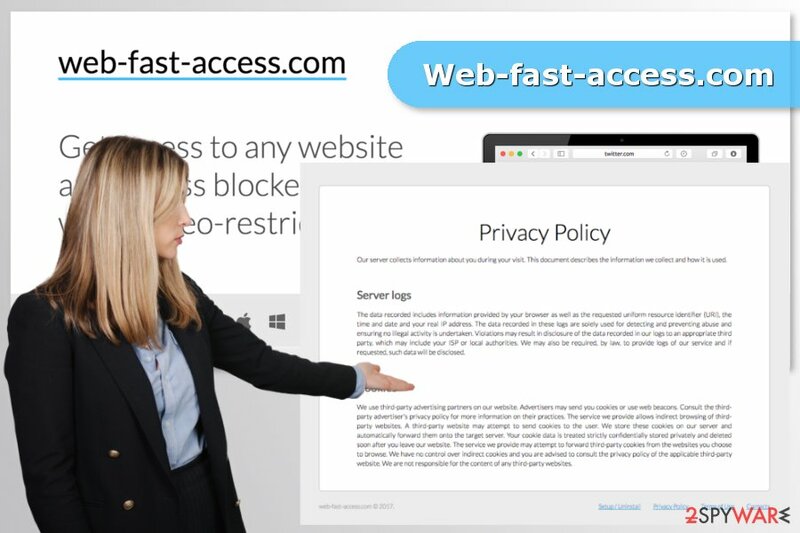 Web-fast-access.com is the PUP that uses misleading techniques to prevent removal. Use Reimage to locate malicious components and get rid of them faster than with uninstall instructions. A full system scan blocks virus reappearance and prevents traffic to malicious domains. 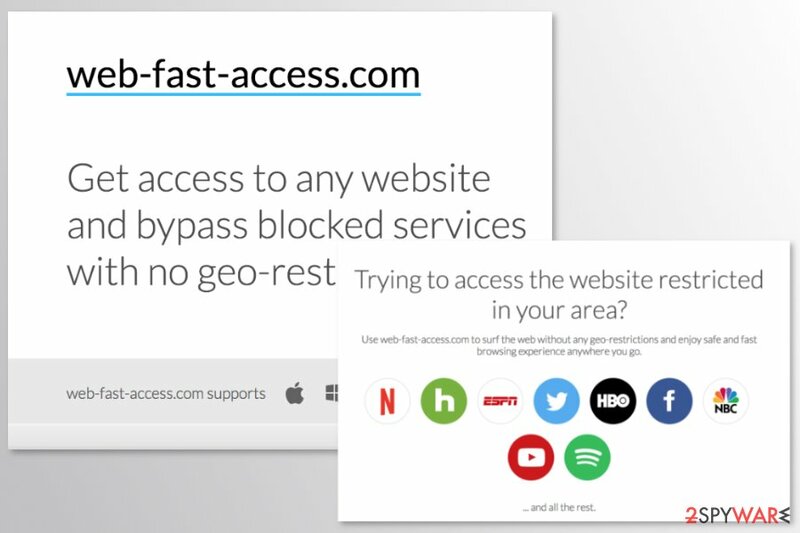 Web-fast-access.com is a website that promotes a service that allows accessing geo-restricted websites. However, seeing redirects to this or related sites is not a good sign. Actually, it means that your computer has been infected with an adware program. The Web-fast-access.com virus is similar to Fast-Access-Web virus which is also known as a potentially unwanted program (PUP) that might make undesired changes on the browser and cause browsing-related problems. You can recognize this particular adware by frequent redirects to web-fast-access.com/wpad.dat site. From there, you might be redirected to numerous sponsored websites, online shops or even potentially dangerous Internet sites. Additionally, you might notice various shopping offers, security alerts or pop up asking to install updates labeled as Web-fast-access.com ads. Clicking on such content is not recommended. Some of these ads might be malware-laden or lead to high-risk sites. However, other Web-fast-access.com redirect problems might also occur. When you browse the web, you might be suddenly forced to visit a third-party site or notice new browser’s tab opened. These activities diminish browsing experience and should not be tolerated. However, it might not be easy to remove Web-fast-access.com adware from Internet Explorer or Mozilla Firefox. This potentially unwanted program might modify proxy or DNS settings. Therefore, affected browser’s reset might be needed. Indeed, developers of this program generate pay-per-click and online advertising-based revenue. Thus, each your click is worth some money. As we have mentioned, one of these clicks might end up with a malware attack. Therefore, you should focus on Web-fast-access.com removal with Reimage to avoid possible cyber threats. Web-fast-access.com redirects warn about adware infection that should be eliminated immediately. If you visit this website, you will not find the active download button. 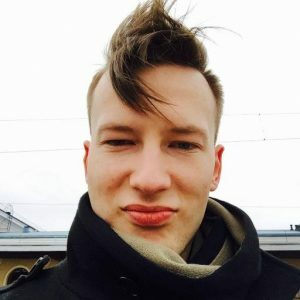 There’s no doubt that developers apply bundling technique to install this PUP to users’ computers and this strategy is perfect because it allows silently infiltrating the system if the user relies on Standard/Basic freeware installation settings. The Web-fast-access.com hijack occurs when you download some freeware or shareware using a recommended setup which rarely notifies about an installation of additional apps that were attached to the primary program. In order to avoid this situation, you should use Advanced/Custom settings and monitor installation process. Security experts from Estonia noticed that manual Web-fast-access.com removal might be complicated. Nevertheless, the official site presents a guide that shows how to eliminate this program; sometimes it does not work. Indeed, our team received reports that these instructions did not help and users continue suffering from annoying redirects. To remove Web-fast-access.com entirely, you have to investigate the system. It doesn’t matter if adware affected Mac or Windows device, you should still look up for malicious files and programs that may have been installed. The instructions below will tell you how to complete this task. Here, look for Web-fast-access.com or any other recently installed suspicious programs. Wait until you see Applications folder and look for Web-fast-access.com or any other suspicious programs on it. Now right click on every of such entries and select Move to Trash. Open the browser and click on Tools button. Open Connections tab and hit the LAN settings button. In the newly emerged window, remove the checkmark from Use automatic configuration script and delete the link in the address bar. When in the new window, check Delete personal settings and select Reset again to complete Web-fast-access.com removal. Once these steps are finished, Web-fast-access.com should be removed from your Microsoft Edge browser. Open Firefox and click Menu button. Go to Network tab and click the Settings button. In the newly appeared window, click Automatic proxy config URL option and delete http://web-fast-access.com/wpad.dat from the address bar. Here, select Web-fast-access.com and other questionable plugins. Click Remove to delete these entries. Now you will see Reset Firefox to its default state message with Reset Firefox button. Click this button for several times and complete Web-fast-access.com removal. Here, select Web-fast-access.com and other malicious plugins and select trash icon to delete these entries. Click Reset to confirm this action and complete Web-fast-access.com removal. Here, select Extensions and look for Web-fast-access.com or other suspicious entries. Click on the Uninstall button to get rid each of them. Now you will see a detailed dialog window filled with reset options. All of those options are usually checked, but you can specify which of them you want to reset. Click the Reset button to complete Web-fast-access.com removal process. ^ Mary Landesman. What Are Adware and Spyware?. Lifewire. Tech how-to guides and tutorials. ^ Jiří Hanák. Malware in ads causes trouble for millions of people. But ad publishers still fight against ad blocking. MasterDC Blog. The blog abot technologies. ^ Viirused. Viirused. Latest cyber security news and research from Estonia. This entry was posted on 2017-10-20 at 08:50 and is filed under Adware, Viruses. You can quickly scan the QR code with your mobile device and have Web-fast-access.com virus manual removal instructions right in your pocket. How did you remove Web-fast-access.com virus?